In T. S. Eliot’s famous model for artists and their creations delineated in “Tradition and the Individual Talent,” all the works of art throughout history exist as monuments that “form an ideal order among themselves.” Although this arrangement can be “altered” slightly, Eliot stresses the “conformity between the old and the new” (“Tradition,” 15). Eliot’s conservative canon preserves an existing binary order—authors are major or minor; works are canonical or noncanonical—and leaves little room for major upheaval or disruption. However, most modernist authors saw their projects as less static and more expansive than Eliot’s metaphor would indicate. In his critical response to Eliot’s metaphor, Ezra Pound contended, “It would be healthier to use a zoological term rather than the word monument . . . [and] easier to think of [literature] as something living than as a series of cenotaphs.” Pound’s critique suggests a more animate model for the artistic project, one that rejects notions of stability and canonization, preferring instead a dynamic and chaotic interchangeability that destabilizes and disrupts hegemonies. In seeing literature as constituted by a process of mutation and change, modernists also recognize the need for tools to navigate this unstable domain of cultural production that we now imagine to be more like an expanding universe than a monument of stone. The chapters in James Joyce’s epic Ulysses, for example, present different narrative methods for constellating the same domain: Joyce’s 1904 Dublin. The effect is that readers observe the places, people, and events of this domain from new and shifting points of view, sequentially and simultaneously, in a nonlinear assemblage of events. In a surprisingly moving moment in the “Ithaca” section, Stephen and Bloom attempt to find patterns in the stars: “With what meditations did Bloom accompany his demonstration to his companion of various constellations? . . . [O]f the parallax or parallactic drift of socalled fixed stars, in reality evermoving wanderers from immeasurably remote eons to infinitely remote futures.” The constellations, which are often associated with cultural narratives, are one important navigational tool for mapping the fixed positions of the stars. But Bloom also understands that what we see from our position on Earth is limited. Parallax, the principle that objects seem to occupy different positions when seen from different perspectives, remains an apt metaphor for modernism’s attempts to chart the “evermoving” domain of human experience. Modernists recognized the importance of contemplating the network of human experience from different and multiple points of view. Accepting that information is something shifting, even organic by nature, it is with this concept of parallax that we consider how a web ontology—a formal method for describing the semantic structure of relationships among items in a digital domain—allows us to productively draw upon the modernist interest in multiplicity and to consider modernism and digital scholarship from multiple simultaneous angles as a fluid network of actors, productions and places, interconnected by different kinds and degrees of relationships. In this seven-sectioned paper, modeled on Woolf’s seven-sided flower in The Waves, we offer an expansive meditation on how dynamic web ontologies enable us to conceptualize modernism as a relational network. When structuring information, dynamic web ontologies resist any one center or perspective, favoring instead the multiple, the temporary. Building a web ontology for the Linked Modernisms Project (LiMo) has allowed us to conceptualize modernism as decentralized and unfixed, prompting us to disrupt, question, aggregate, and complicate existing semantic terminology and relationships; to create resistances against fixed classification; and to theorize the temporary nature of such rhizomatic structures. Fig. 1. Screen capture from Linked Modernisms Project showing degrees of separation between literary modernists, December 12, 2016. The interest in parallax and multiplicity that characterizes modernism anticipates Gilles Deleuze and Felix Guattari’s notion of rhizomatic networks, as described in A Thousand Plateaus, which inspired our conceptualization of the LiMo ontology. Deleuze and Guattari’s notion of the rhizome is biological, based on the common plant root system of the same name, found in asparagus, ginger, and many types of grasses. They define a rhizome by contrasting it with a tree, which, they argue, is binary, having a central trunk with branches growing out of it. A rhizome is a different kind of system, one with no central trunk, and comprising interconnected nodes. Rhizomes are complex, heterogeneous “assemblages” of things, in which every point is connected to every other point: multiplicities, not binaries. A constellation is another example of a rhizomatic assemblage: viewed from Earth, the stars form a pattern when connected by imaginary lines. Each point is also, simultaneously, connected to every other by unfathomable distances of space and time. A rhizome is an emergent system rather than a predetermined one, “a map and not a tracing” (Deleuze and Guattari, A Thousand Plateaus, 12). As Deleuze and Guattari write, “A rhizome has no beginning or end; it is always in the middle, between things, interbeing, intermezzo. The tree is filiation, but the rhizome is alliance, uniquely alliance. The tree imposes the verb ‘to be’ but the fabric of the rhizome is the conjunction, ‘and . . . and . . . and . . .’” (25). This multiplicity renders a rhizome simultaneously flat and infinitely unflat, just as a constellation is both a two-dimensional image and a three-dimensional assemblage of points. Whereas Eliot’s understanding of modernism is binary, Pound’s vision of a “zoological” modernism is more rhizomatic, an emergent, decentered, and expansive vision captured in the catchphrase “make it new.” Visualizing modernist literature as a rhizome rather than a tree will prompt scholars to change our understanding of the field and our critical relationship with it. Ontologies enable the organization of information into a rhizomatic structure, unlike the more traditional taxonomies, which have a binary, tree-like structure. The purpose of a taxonomy is to organize a set of homogenous things into discrete categories based on their differences: a work of literature, for example, is either a novel, a poem, or a play. Ontologies have a rhizomatic structure. Because the purpose of an ontology is to organize a set of heterogeneous things by mapping connections among them, things are categorized based on their similarities: a work of literature can be a novel, a poem, and a play. When we developed a dynamic ontology to describe the expansive, interdisciplinary, international cultural domain of modernism, we identified three classes: Agent, Production, and Place. Everything that falls within the domain of modernism belongs in at least one of these classes, which can be organized into subclasses. For example, Person and Group or Movement are subclasses of the Agent class, since people, groups, and movements can all create and do things. Artifact, Concept, and Event are all subclasses of Production, things that are created by Agents. Places are geographical or physical locations, such as City, Country, Place of Study, and Venue. The classes and subclasses of our ontology thus capture an “is a” relationship: any city is a place. But our ontology further complicates the categories Agents, Places, and Productions by including the different kinds of relationships that exist between them. In this way, the ontology allows us to follow relational paths between things––paths involving creation, association, and inspiration, for example—to map the cultural domain of modernism. Like the rhizomatic map described by Deleuze and Guattari, the map of modernism that the ontology facilitates is a tangle of connections among Agents, Productions, and Places, an assemblage without a center. One important characteristic of a rhizome that differentiates it from a tree is its degree of abstraction. Because a taxonomy defines things according to their differences, it must define what those differences are: it must concretize the relationships among things. But because an ontology classifies rather than defines and does so based on similarities, its classes are descriptive rather than definitional, and can therefore be abstract. For example, the LiMo ontology includes the object property associatedWith, which captures relationships between things that are too nebulous to define concretely but that add texture and substance to the assemblage of modernism that the ontology describes. Perhaps the most significant effect of viewing modernism as a rhizome rather than a tree is that it flattens the hierarchy in which the domain is traditionally imagined. In the field of literary modernism, for example, some schools of criticism have taken the text as the center, relegating the notion of the author and the geographical, historical, and social context to the periphery or, in the case of New Criticism, disregarding them altogether. In a rhizomatic modernism, however, all hierarchies are collapsed. Any point—any author, any text, any place—can be taken as the center. We can trace direct lines between this center point and another to create a flat outline, or we can trace all the connections between all the points to create a three-dimensional, infinitely unflat network. This network captures the multiplicities that comprise modernism in what Jerome McGann might call the “n-dimensional space” of this cultural domain. This flattened/unflattened modernism enables a radically new relationship between scholars and objects of study, since anything and everything within the domain can be taken as central, an object worthy of scholarly attention. Fig. 2. 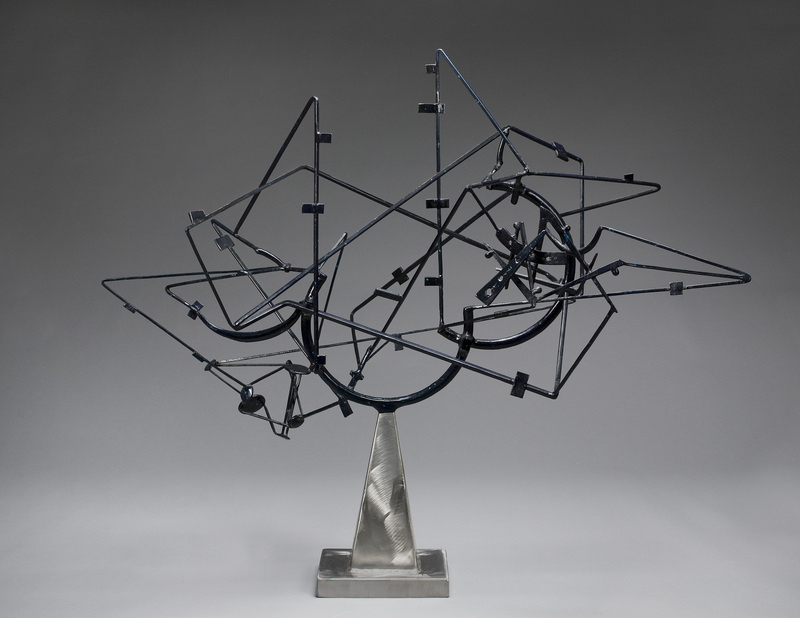 David Smith, Star Cage, 1950, Painted and brushed steel, 114 x 130.2 x 65.4 cm. Frederick R. Weisman Art Museum, Minneapolis. Meaning begins with classification, but recognizing the dynamic nature of relationships among and between classes in a domain and the instances where relationships challenge an item’s status in a class is central to the cognitive processes that allow scholars to extend or transform meaning according to new information. Class expressions and logical axioms are additional strategies that ontologies offer for extending, transforming, decentralizing, and reassembling fixed relationships. Class expressions—formal, machine-readable specifications of the conditions that group certain individuals in a domain—compel us to logically define the relationships that make those individuals meaningful within that domain. For example, in LiMo, we define an Agent in the domain of modernism as any individual who has some relationship to artistic production or to other agents in the domain. We define a Novelist as any Agent that wrote at least one novel. Djuna Barnes is not a novelist simply because we classify her as such; rather, we infer that because she wrote the novel Nightwood, she is a novelist. She also wrote satire, and therefore, according to the axioms in the ontology, she must also be a satirist even if we fail to remember to classify her as such. Axioms allow us to state how the entities in our ontology are related. For example, in the LiMo ontology at present, any Agent who is associated with some member of a movement is also associated with that movement. Thus, because Djuna Barnes is associated with Baroness Elsa Von Freytag-Loringhoven, and the Baroness was a Dadaist, Barnes is also associated with the Dadaist movement. Because Barnes had a relationship with Mary Pyne, who wrote for The New York Press, Barnes is associated with the weekly paper. Thus, however we initially classify Barnes, she may slip between other categories by virtue of what she did, whom she associated with, and what she produced. By creating a web ontology, we allow the computer to infer relationships, connections, centers, and constellations between individuals within the domain of modernism that have not been discovered before, which, in turn, compels us to constantly reconsider our classifications and assumptions about the network of modernist production. Fig. 3. The ontology reasons that Barnes is a Novelist because she wrote Nightwood, which is a Novel. Fig. 4. The ontology reasons that Barnes is associated with Dadaism because she is associated with Baroness Elsa von Freytag-Loringhoven, who is associated with Dadaism. The study of modernism has extended to incorporate all domains in the field of cultural production, and can productively contribute to the greater project of defining the meaning of information on the web. In what will surely redefine future notions of “authorship” in a linked data future, the Semantic Web includes a rapidly expanding cloud of open access scholarly resources in a variety of interconnected domains, connected by hundreds of variable vocabularies. In 2011, the number of datasets was 295, whereas in 2014 the number grew to 1014. In the domain of cultural and artistic production, The Internet Philosophy Ontology Project (InPho), The Orlando Project, and Linked Jazz are other examples of humanities projects using ontologies to formally describe the humanities fields of philosophy, women’s writing, and jazz music. The semantic web allows scholars in these domains to freely and openly transcend the boundaries of traditional scholarship through the interoperable discovery of relationships among agents, productions, and places within a digital universe. Ontologies are the key to unlocking these relationships, and interlocking with other Semantic Web languages. The architecture of the Semantic Web provides a framework of formal description using controlled vocabularies to describe items, including concepts, terms, and relationships. Whereas in a physical library catalogue these items are described, like in Deleuze and Guattari’s binary trees, as distinct, separate entities—and categorized by Library of Congress subject headings as the primary access points—in the Semantic Web there are endless points of access to facilitate new models of discoverability and navigation, across multiple formats. Datasets, as described by ontologies, express a multiplicity of meanings through interconnected relationships. Someone like Simone de Beauvoir, for example, could be simultaneously defined according to similar but different datasets, offering a complex data portrait of de Beauvoir composed of multiple layers of information. The fulsome and rhizomatic architecture of the Semantic Web anticipates the evolution of machine learning within the realm of quantum computing and artificial intelligence, promulgating a dynamic and shifting center that creates radical and infinite possibilities of reciprocal discovery for future interdisciplinary scholarship. Because each dataset captures the world in a different way, networking these datasets provides alternative, yet connected, views of the world. And just as a moon is held by a planet’s gravitational pull, a planet’s trajectory is relational to the orbits of other planets and stars within its solar system, and that system is linked to a larger known (or, more interestingly, unknown) universe, all the cosmic elements of the semantic web exist as one informed universe that is ever expanding, simultaneously folding in and out of itself, in a sustained state of parallax, like the seven-sided flower. Fig. 5. 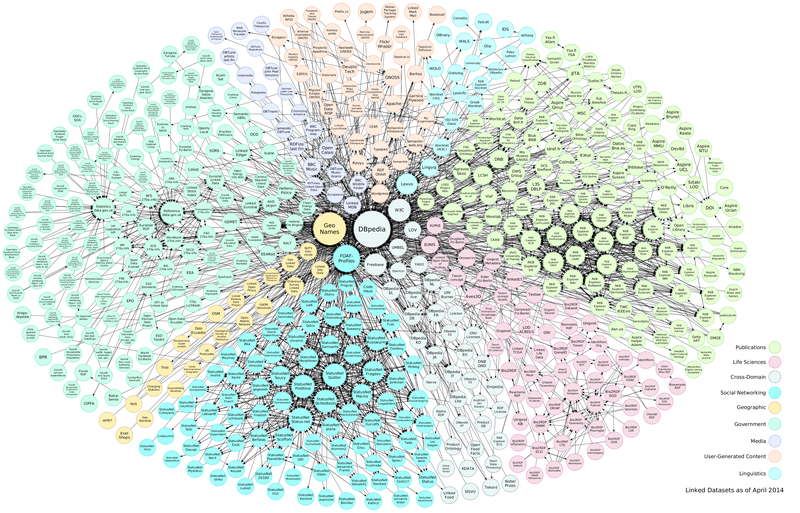 Linking Open Data cloud diagram 2014, by Max Schmachtenberg, Christian Bizer, Anja Jentzsch and Richard Cyganiak, http://lod-cloud.net. In every possible dimension, an ontology branches out, flowing in a stream of consciousness that is wild, rambling, organic, lush, and fecund. Results abound at every angle of intervention, in every ripe inquiry. It blooms endlessly, multiplying upon itself, in countless and unlimited dimensions. Just as Molly Bloom’s speech in “Penelope” at the conclusion of Ulysses proliferates a free association of thoughts, feelings, ideas and emotions, an ontology engenders a state of association adhering to the rhizomatic principle of multiplicity. Echoing the words of Molly Bloom, there is only yes, and yes, and yes again. Negation is systematically impossible. Only other options, simultaneously presented, in all manners of dimensions, exist. There are only further options, further selections, further connections, further determinations. Modernism is not a fixed series of consequential historical events, but a fluid network of cultural associations and interconnected global activities. As an assemblage of classes, subclasses, and the dynamic relationships between them, an ontology illustrates the interstices between known and heretofore unknown relationships, disrupting the canonical narratives that persist about hegemonies of modernism, flattening assumptions about race, class, and gender. It presents objective information in a non-objective flow, denying binary categorization and authorial control. Like Marcel Duchamp’s artistic alter ego Rrose Selavy, an ontology presents gender identity as neither either/or but as both, or all, or none. It informs how we can perceive the traditional boundaries of identity, allowing us to transcend social constructions and hierarchies of gender and identity, flattening existing networks of information and presenting new relationships not previously identified or explored. The assemblage of these elements presents radical possibilities of discovery for the interpretation of new information about modernism and digital scholarship. Connections not before realized can now be visualized, illustrating relevancies and degrees of separation and influence, both directly and indirectly, to generate a reconceptualization of modernism. The nonbinary multiplicities of the ontology warp, and simultaneously echo, the original principles of modernist production, conceptualizing modernism—and its resulting clusters of correlated information—in accordance to its dynamic and living nature and in perpetual and joyous resistance to any one dominant narrative. The ontology conflates terms through the chance operations of machine reasoning in radical affirmation, providing a model for re-examining the material conditions and informational structures that enabled, and continue to create, the central moment(s) of modernist production. The subtitles for our paper play with the format of RDF triples, which model computational declarations on statements in spoken language that consist of subject, predicate, and object. Recommended by the World Wide Web Consortium, RDF (the Resource Description Framework) provides a standard for describing and linking resources on the web, and it is widely used by ontology builders. T. S. Eliot, “Tradition and the Individual Talent,” in Selected Essays (London: Faber and Faber, 1941), 15. Ezra Pound, “Prefatio Aut Cimicium Tumulus,” in Modernism: An Anthology of Sources and Documents, ed. Vassiliki Kolocotroni, Jane Goldman, and Olga Taxidou (Chicago, IL: University of Chicago Press, 1998), 496–502, 497. In their influential article “The New Modernist Studies,” Douglas Mao and Rebecca L. Walkowitz describe modernism in terms of “expansion . . . in what we might think of as temporal, spatial, and vertical directions” (PMLA 123, no. 3 : 737–48, 737). James Joyce, Ulysses (London: Penguin Books, 2000), 819. The Linked Modernisms project is led by Stephen Ross at the University of Victoria and co-founded with Jentery Sayers, Susan Brown, Ray Siemens, Colin Allen, and Jon Saklofske. 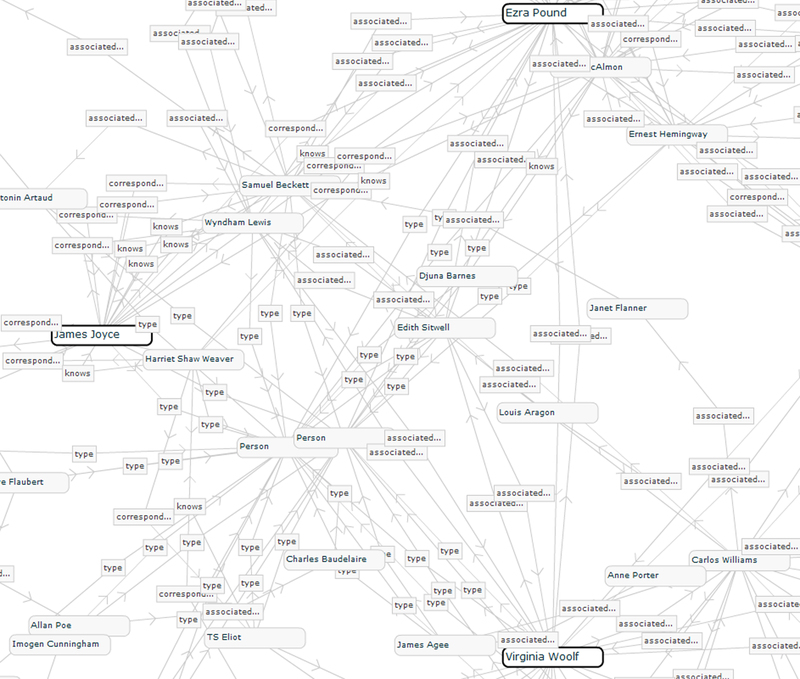 The project uses an open source web ontology to provide a platform to visualize and analyze the metadata collected for and generated by the Routledge Encyclopedia of Modernism. Gilles Deleuze and Felix Guattari, A Thousand Plateaus, trans. Brian Massumi (Minneapolis: University of Minnesota Press, 1999), 7–9. This nomenclature, using camelCase rather than spaces between words, is a convention of ontology building. For more about naming conventions, see Matthew Horridge, “A Practical Guide to Building OWL Ontologies Using Protégé 4 and CO-ODE Tools, Edition 1.3,” University of Manchester. Last modified March 24, 2011. Jerome McGann, “Visible and Invisible Books: Hermetic Images in N-Dimensional Space,” New Literary History 32, no. 2 (2001): 283–300, 298. Stan Ruecker’s notion of rich-prospect browsing interfaces similarly emphasizes the potential of non-taxonomical data structures based on “meaningful representation” for offering new ways of navigating and understanding data. Stan Ruecker, “Rich-prospect Browsing Interfaces,” Encyclopedia of Multimedia Technology and Networking, Second Edition (IGI Global, 2009). Andrejs Abele and John McCrae, “The Linked Open Data Cloud Diagram,” last updated August 22, 2017.